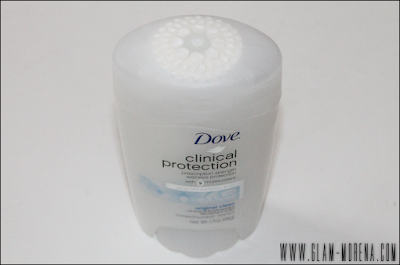 Glam Morena: Giveaway: Dove Clinical Protection Anti-Perspirant. 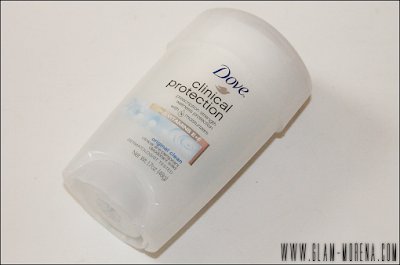 Giveaway: Dove Clinical Protection Anti-Perspirant. Dove is pretty much the main brand I use when it comes to deodorant or anti-perspirant. There are a few different Clinical Protection anti-perspirants available: Original Clean, Soothing Chamomile, Rebalance, Revive, Cool Essentials, and Clear Tone Skin Renew. 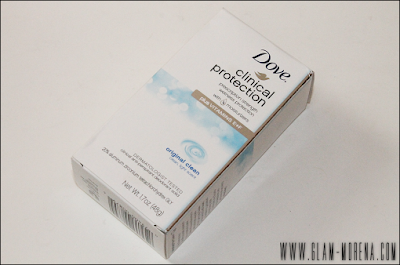 I've been using the Dove Clinical Protection Original Clean lately. Be sure to scroll below to enter the giveaway! Description: Dermatologist tested Dove Clinical Protection delivers prescription strength defense against wetness and contains Dove® ¼ moisturizers to care for delicate underarm skin. And unlike leading prescription anti-perspirant/deodorants, it does not contain aluminum chloride or alcohols which can cause skin irritation and discomfort. With our most powerful all-day protection and exceptional skin care benefits, it is the ultimate combination of strength and beauty. Overall Thoughts: This is a must-have product for me. While this product is marketed towards those who might have issues with sweating those who don't can still use it too. I live in a warmer climate so I like the extra protection this provides. The smell is really fresh and nice. Though this does contain a fragrance it's not annoying or irritating to my skin. I really like the results! The packaging isn't my favorite because I feel like it does not dispense evenly from the packaging. You have to twist the bottom to get the product out. The Clinical Protection deodorant tends to cost more than the regular deodorants. I find that to be the bigger downside especially since this is a type of product you would buy regularly. WIN YOUR OWN DOVE CLINICAL PROTECTION TO TRY! 1. Must be a Google Friend Connect (GFC) Follower. 2. Must be a U.S. resident. 3. Leave a comment letting me know if you've tried Dove before or not. 4. Leave an e-mail address within your comment. Awesome giveaway! I have tried dove deodrant before and I LOVE IT! It is amazing! I've tried Dove deodrant and soaps before and I love them! I've tried Dove before, it's one of my favorite Skincare brands. I love the lotions and shower gels. This is my go-to deodorant! I suffer from a hormone imbalance and this is the only thing I've found that keeps me dry. It is a little bit expensive, tho! I have tried this and it is one of my favorite products!